Everyone can find a place to learn and grow at Johnson Senior High School. Our school is home to the district’s Aerospace & Engineering Academy that attracts students from all corners of St. Paul. As a certified "Project Lead the Way" school, students can choose from six different pre-engineering classes that offer college credit, as does our broad range of Advanced Placement and College in the Schools courses.. Johnson offers students many ways to follow their interest, including more than 35 clubs and organizations and 25 athletic teams. Every student completes a senior assignment that demonstrates they can write well, speak confidently, and successfully manage a major project on time. We’re proud of our community and business partnerships, notably 3M and Hiway Federal Credit Union as well as colleges and universities, ensuring that every student has a plan for education after high school. Johnson Senior High School is located on the historic east side of Saint Paul. 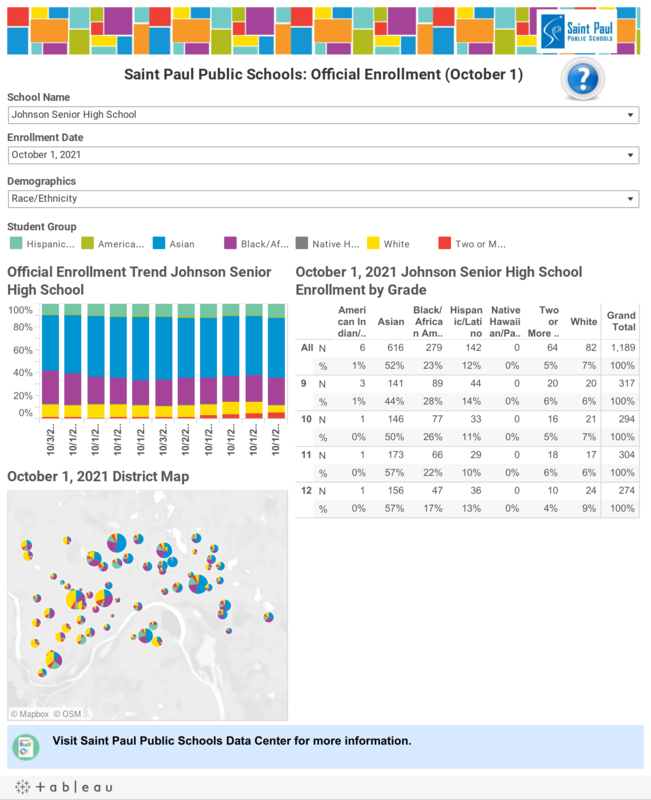 Johnson is a 9-12 school with approximately 1300 students and an average class size of 28.5. The building is a two-story brick structure which includes a half lower level walkout to the west used for vocational, art, and physical education facilities. In the building's 218,000 square feet are classrooms, media center with computer lab, cafeteria, gymnasium and field house, pool, auditorium, health clinic, and well-equipped labs in science, family and consumer science, and web design. We are home to the Aerospace and Engineering Magnet and an Air Force Junior ROTC program. In addition, we are a certified Project Lead the Way high school. Johnson Senior High School features a four-quarter, seven-period per day schedule. Students and parents are encouraged to create a six year plan which will show a student's path through high school graduation and into post-secondary education. In addition to a full range of general and special education courses, Johnson offers Advanced Placement (AP) courses. Students also can earn college credit through Advanced Placement (AP) classes, College in the Schools (CIS) classes, and Project Lead the Way (PLTW) classes offered at Johnson; and through post-secondary options. Students receive training in computer technology through course work and lab experiences. The Freshmen Focus course orients students to high school, teaches study skills and begins the process for career exploration and planning. All Johnson seniors complete a senior project requirement for graduation. A dynamic partnership with 3M provides Johnson students with opportunities for internships, e-mentoring experiences, mock interviews and summer programs. The Air Force JROTC (Junior Reserve Officer Training Corps) provides leadership opportunities. Computer Aided Drafting and Design (CADD) courses prepare students for future employment opportunities in architecture, engineering, and industrial and product design. Saint Paul Public Schools engages in a process of continuous improvement. At the school level, a major tool in the improvement process is the School Comprehensive Improvement Plan (SCIP). The SCIP is a strategic document that district schools utilize to identify annual improvement priorities at each school. Click here to learn more about SPPS SCIP Process.